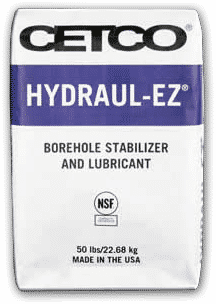 Cetco® Hydraul-EZ™ is a high yield, 200-mesh sodium bentonite clay with a special dry polymer additive. It is designed to maintain borehole integrity in horizontally drilled boreholes. Hydraul-EZ™ is certified to NSF/ANSI Standard 60, Drinking Water Treatment Chemicals – Health Effects.